Testing is the backbone of direct response marketing. Always test. 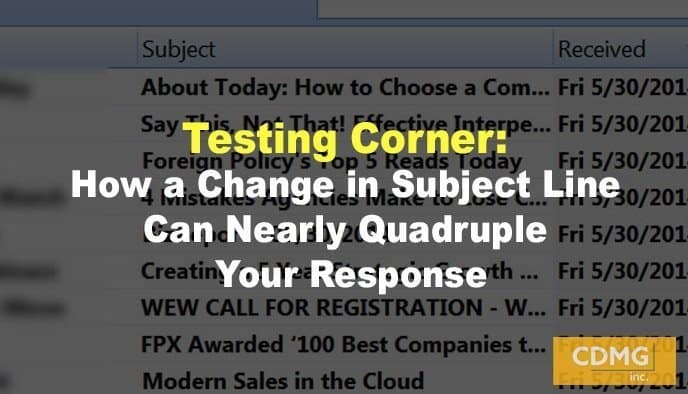 Test your subject line, copy and your graphics. There are hundreds of variables you can test that could help you boost your response. I recently did a campaign for a newsletter called Strategic Investing. I sent the same email to the same list – but I changed the subject line. New cancer breakthrough triggers potential 1,000% profit chance. Early investors could collect 1,000% gains from the end of cancer. Which do you think performed better? If you guessed A, you’re correct. In fact, A got a 260% higher response rate than B. “A” got nearly 4X the response. If you’d like to talk to me about how to create great subject lines that generate new leads and profits, give me a call at (310)212-5727, or email Caleb at caleb@cdmginc.com.